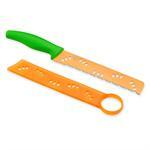 Kuhn Rikons Colori citrus knife is a three-in-one tool. 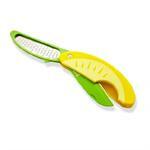 The blade is ideal for cutting sections of citrus fruits, and it folds away into the handle for safe keeping. 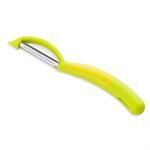 The zester/grater offers finely grated zest for soups, salads, beverages and more. Meow! 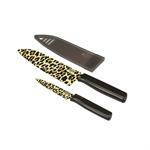 Stylish and fun Cheetah print knives. Four piece Japanese carbon steel knife set includes a chef's knife, a paring knife, and matching sheaths. 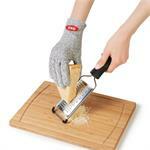 Non-stick coating ensures nothing sticks to the blades. 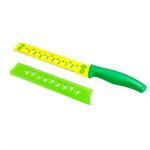 Perfect for cantaloupe, honeydew, and other small melons. Also use for winter squash. 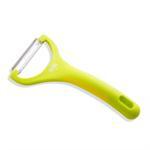 Its stainless-steel blade cuts easily into the skin and through the fruit. Once cut, there is a scoop on the safety sheath to remove seeds. Not just for pineapple, use it on watermelons, cantaloupe, honey dew melons, squash or even crusty breads. The sharp, serrated blade cuts through tough skins with ease.